Opal plum trees provide a sweet dessert plum fruit that show a wide range of colours as they mature. You can expect to see bright yellows through to a deep purple, sometimes all on one fruit. The inside of the plum is a pale yellow and the taste is similar to a Greengage. 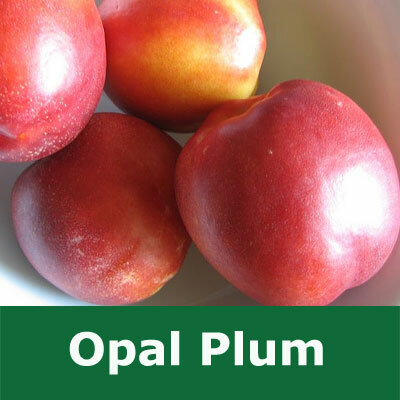 One of the biggest selling points of the Opal plum is that it is one of the earliest cropping trees providing the first flush of the harvest in late July. The Opal plum tree requires a little more consideration when purchasing especially if you live in the North of UK or planting where there is not that much sun e.g. shaded position. As you can already work out from the blossoming period and the time you get fruit the fruits are not on the tree for that long. This means that you plums of the Opal plum tree have less time to develop the sugars so the trade off with getting the plums earlier are that you run the risk of it being a bit of a bland plum when compared to other plums. Planting against a South facing wall will be ideal. The fruits are medium sized and a good red colour turning blue when over ripe, this process taking up to 2 weeks so you won't have to deal with a sudden transition from un-ripe to ripe and finding emergency storage places for many plums. As with many other plum trees, the Opal plum tree fruits can benefit from thinning the harvest out by picking off some of the smaller blossoms and weaker fruits closer to the stem to allow the plum trees efforts to go to developing a slightly smaller but better quality crop. This approach also reduces the chance of bi-annual cropping which is not such a big issue with the Opal plum. Apparently if put in a bowl on a sunny day there is a distinctive plum aroma but we are only going off what "they" say about Opal plum trees and their fruits. We could not guarantee aroma qualities so please don't contact us in a few years time complaining that you purchased this tree with the specific intention of getting free air freshenner capabilities from your tree and want to return it due to lack of smell.